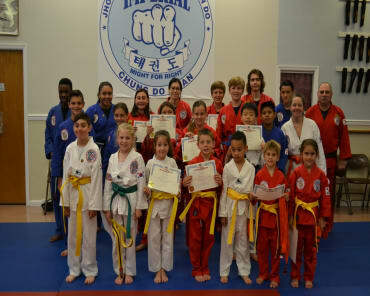 Imperial Martial Arts is a great place to host your child's Birthday Party! Our facility is designed for high energy and fun parties. Many satisfied parents that celebrated their children's Birthdays with us say they had more fun and excitement than they ever thought they would have. All parties are supervised by our professional Black Belt instructors that enjoy the fun just as much as the children! It will give your child and their friends a chance to socialize in a positive educational environment and they will have great memories for many years! Fun Filled & Exciting Birthday Parties Available At Imperial Martial Arts! Our parties are fun and safe with an actual curriculum the same way our regular classes are with meaningful activities. You will not see kids running around and out of control or sitting on the sidelines bored. Our professional Black Belt staff will keep the party moving with motivational and meaningful activities. We'll take care of everything during the party, all you have to do is sit back and enjoy the fun! All you have to do is supply us with your guest list, we can even send out invitations for you so you can relax and enjoy the excitement. Call Now Or Fill Out The Short Form On The Side Of This Page To Reserve Your Spot Today! Please reserve your date 4 to 6 weeks in advance.